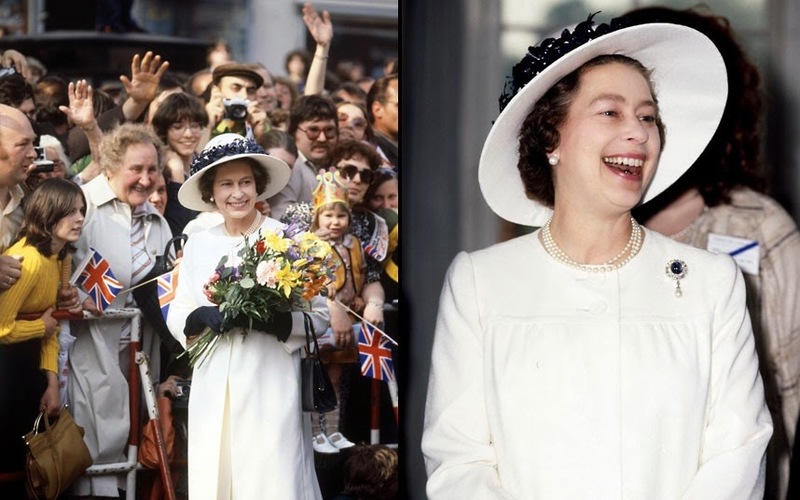 Ahead of the Queen and the Duke of Edinburgh's upcoming State visit to Germany (further details can be found here), here's a brief recap of British-German relations during the Queen's reign. The first visit from a German President to the UK came on 21-23 October 1958, when Theodor Heuss, the first President of the Federal Republic of Germany after World War II arrived in London. 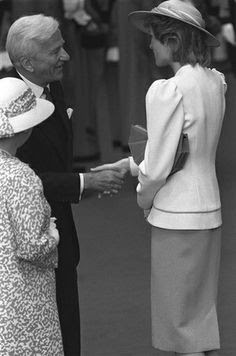 It was, understandably, a visit fraught with potential political minefields, given that memories of the war were still recent. However, Heuss, a democratic-liberal politician who had never been compromised with the Third Reich, was a symbol of confidence in the German post-war Republic in the international community and his foreign visits, among them the one to Britain, contributed greatly to the increase of appreciation toward the still young Federal Republic of Germany. 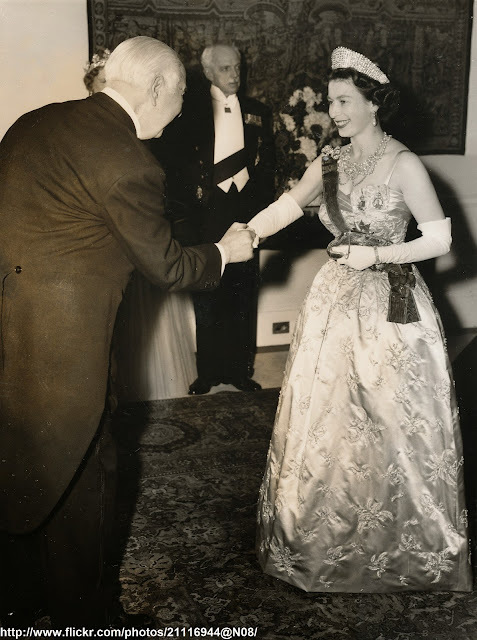 The Queen and the Duke of Edinburgh receiving Dr Heuss upon his arrival in London (President Heuss was a widower, hence the absence of a First Lady). 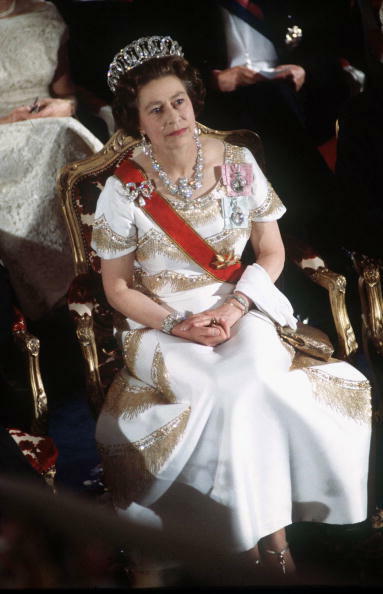 (seen in colour below), accessorised with the Dagmar necklace, originally a wedding present to Queen Alexandra, Queen Alexandra's Kokoshnik tiara and the Dorset Bow brooch. 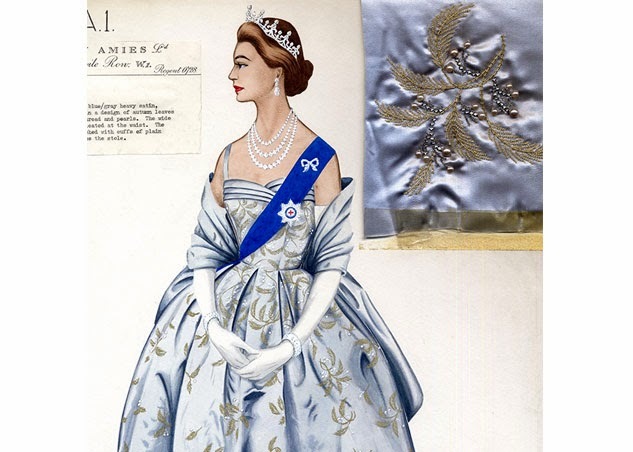 Fashion sketch and fabric sample for the gown. 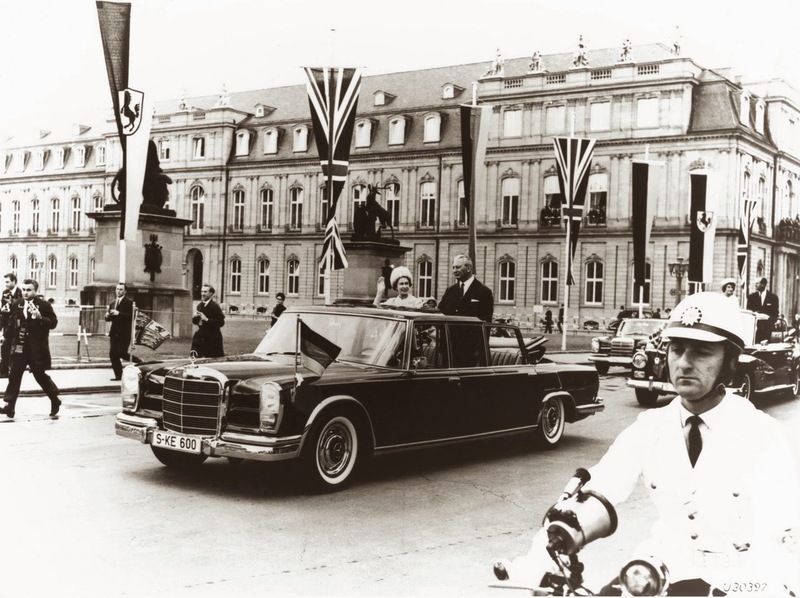 The first-ever visit to the Federal Republic of Germany by the Queen came seven years after President Heuss' visit, from 18 to 28 May 1965. This was the first time a reigning British monarch had set foot on German soil after King George V and Queen Mary travelled to Berlin in May 1913 to attend the wedding of Kaiser Wilhelm's only daughter, Princess Victoria Louise of Prussia, to Ernest Augustus, Duke of Brunswick. 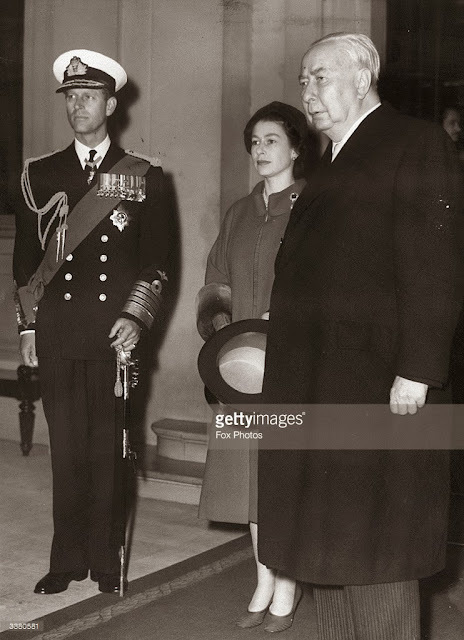 Apart from that, the only other visit to Germany by a member of the British Royal Family had been the hugely controversial tour undertaken in October 1937 by the Duke and Duchess of Windsor (who met Adolf Hitler at his Obersalzberg retreat), against the advice of the British government. 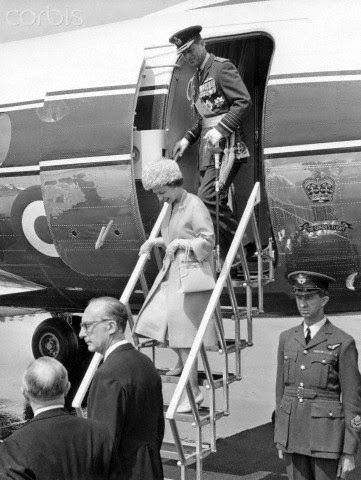 So the Queen's 1965 visit was, in effect, the first official visit in 52 years. 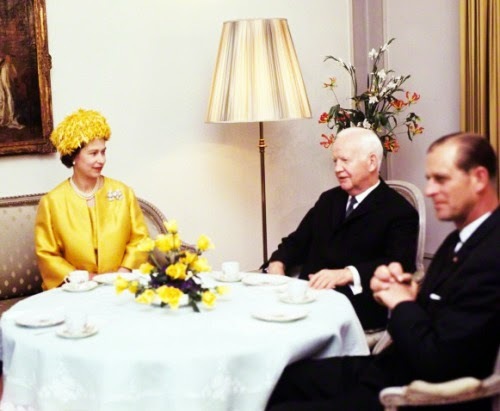 The visit touched Bonn, Munich, West Berlin and Hamburg and the Queen and the Duke of Edinburgh met President Heinrich Lübke (the second President of West Germany), Chancellor Ludwig Erhard and Mayor of West Berlin Willy Brandt. 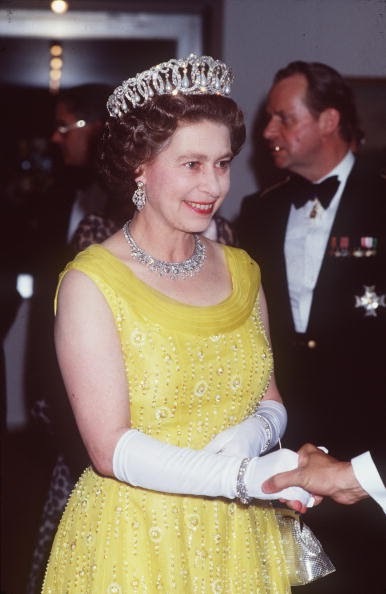 A State dinner was given aboard Royal Yacht Britannia and the royal couple paid a visit to the British Army of the Rhine while in Germany. 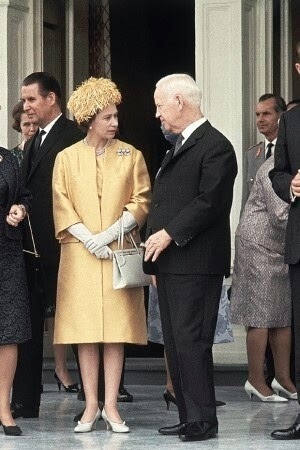 A brief video of the 1965 visit. 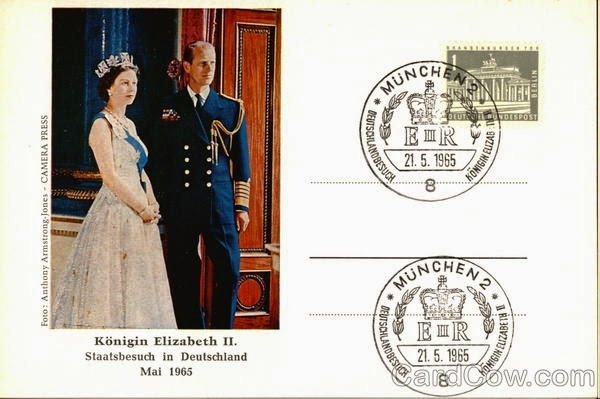 Stamps commemorating the historic visit were issued. 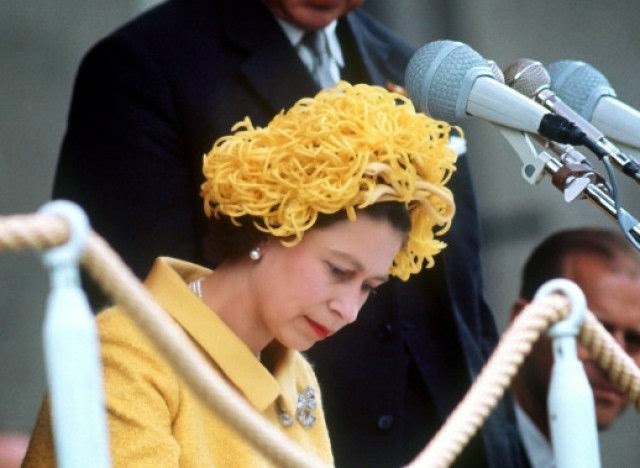 The Queen in Schöneberg, West Berlin. 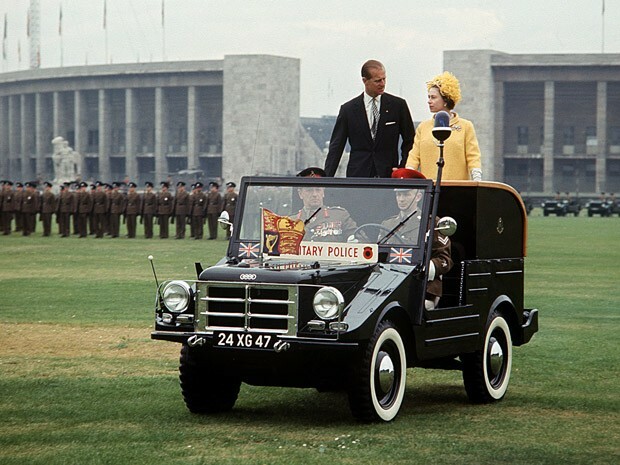 27 May 1965: riding in a Military Police vehicle at Berlin's Olympic Stadium. 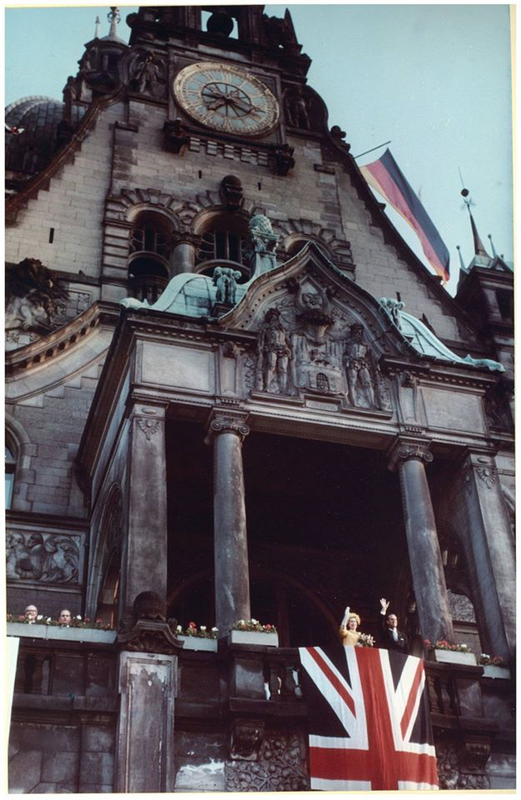 Looking over the Wall at Potsdamer Platz. The Queen and the Duke of Edinburgh in Hanover on 27 May 1965. 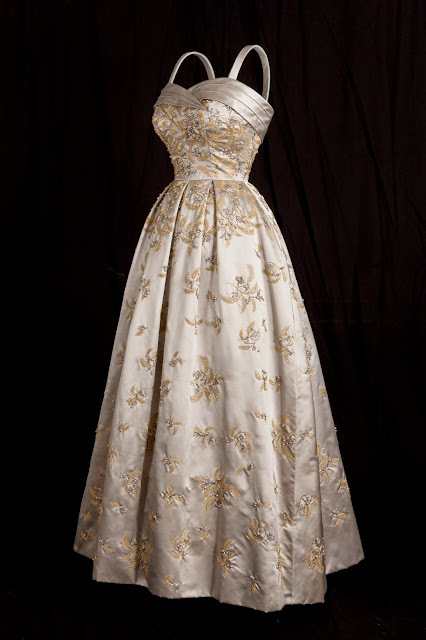 Leaving Schloss Augustusburg in Brühl (a UNESCO World Heritage Site in Rhineland) after a State reception. 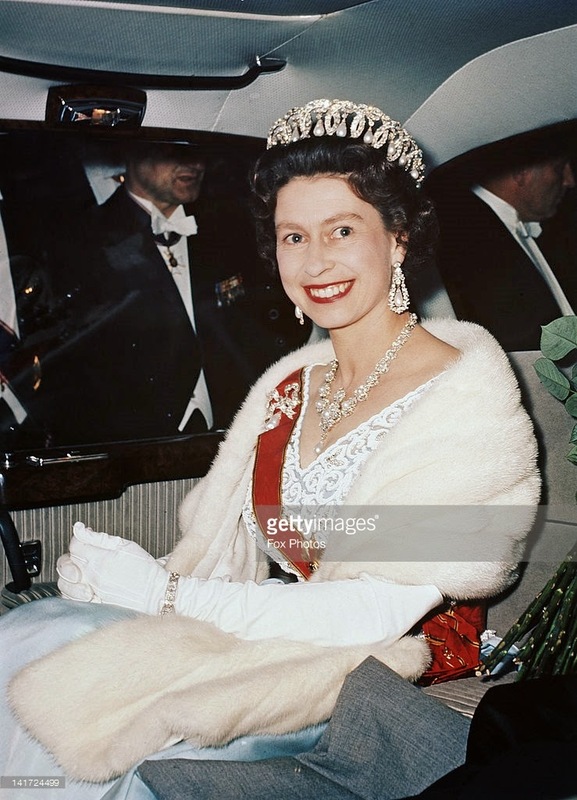 The Queen is seen wearing the Vladimir tiara with pearls, Queen Victoria's Diamond Jubilee necklace, the Duchess of Gloucester's pearl pendant earrings and Queen Mary's Kensington Bow brooch. 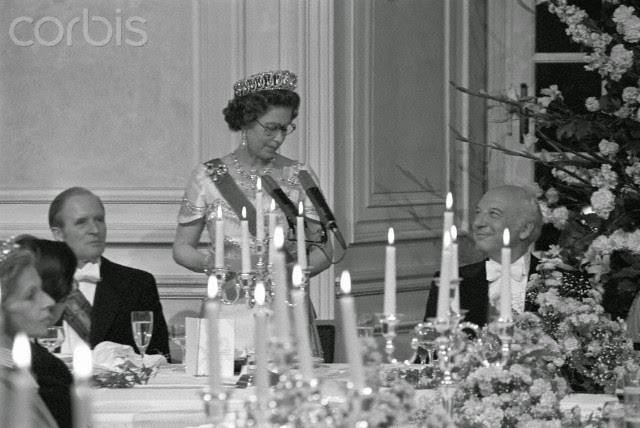 The text of the speech made by the Queen at Schloss Brühl can be found here. 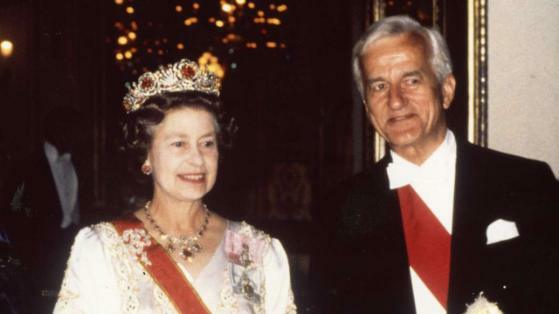 Then, from 24 to 27 October 1972, the Queen hosted the third President of the Federal Republic of Germany, Gustav Heinemann and his wife (seen below) in Windsor and London. 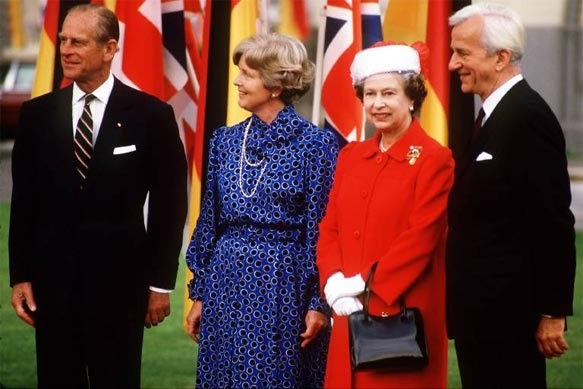 The next visit to West Germany made by the Queen came from 22 to 26 May 1978. 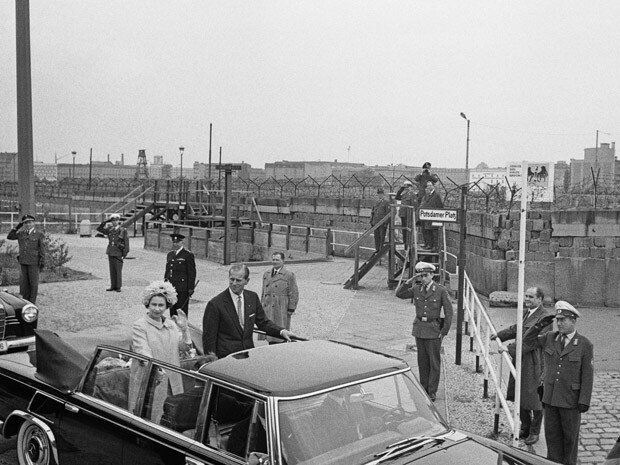 The royal couple toured Bonn, Mainz, Bremen, Bremerhaven, Kiel and West Berlin, visiting President Walter Scheel. 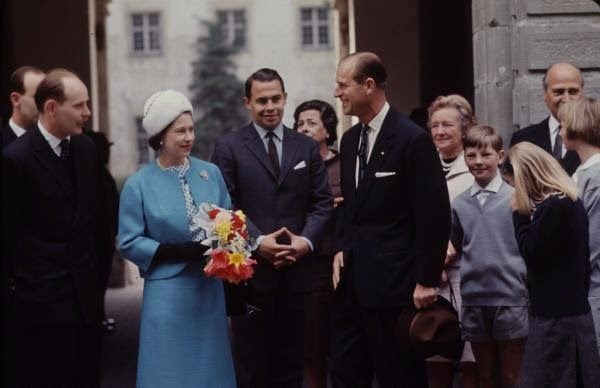 Meeting the public in West Berlin. 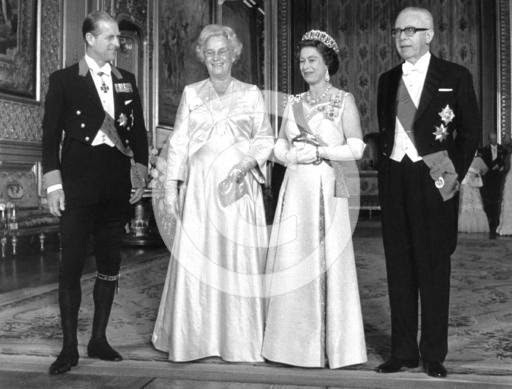 22 May 1978: another official dinner at Schloss Augustusburg in Brühl. 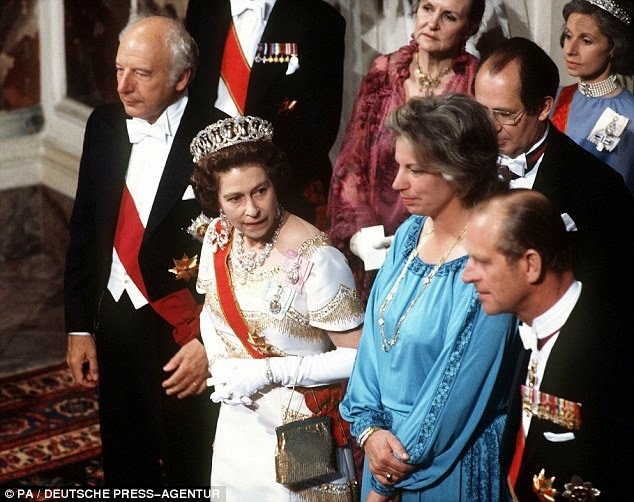 Directly above, the Queen is standing between the President of the Bundestag (l) and President Scheel (r). 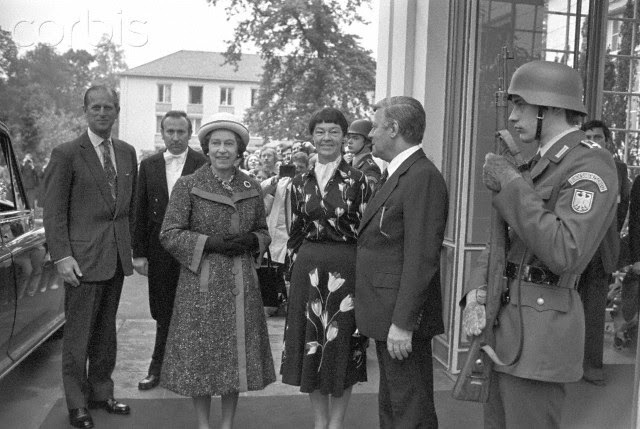 23 May 1978: arriving for a luncheon party at Palais Schaumburg in Bonn given by Chancellor Helmut Schmidt. 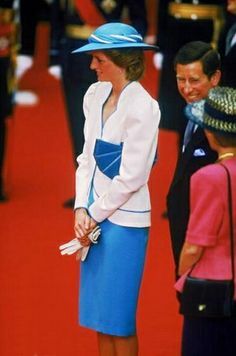 The Prince and Princess of Wales accompanied the Queen to Victoria Station to greet the Presidential couple upon their arrival in London. 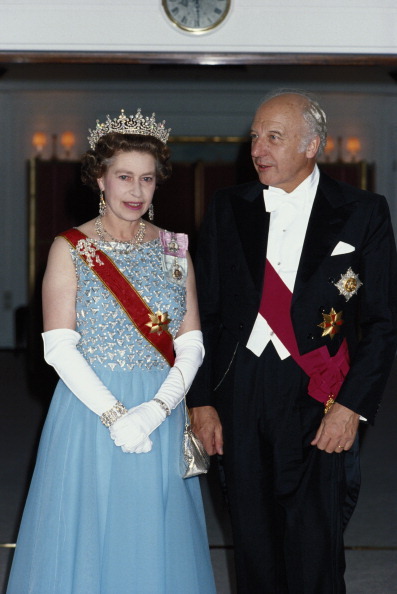 The Queen with President von Weizsäcker at a Buckingham Palace banquet. 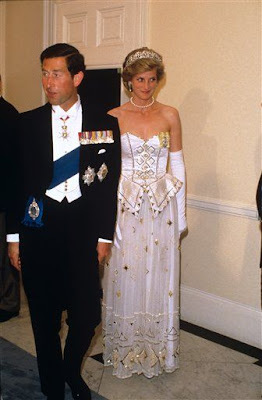 The Prince and Princess of Wales (in Zandra Rhodes) arriving for a banquet hosted by President von Weizsäcker and his wife Marianne at the German Embassy in London on the last night of the Presidential couple's visit to the UK. 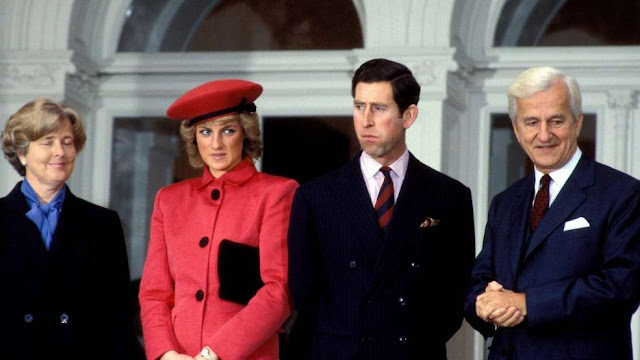 The Prince and Princess of Wales with President and Freifrau von Weizsäcker in 1987. 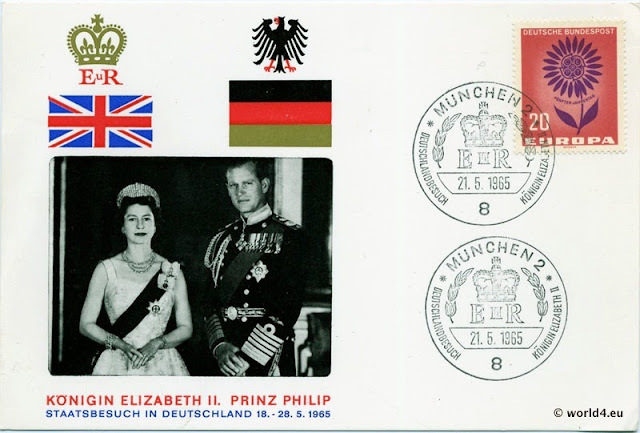 That's all with regard to pre-reunification diplomatic relations between the British Monarchy and Germany. 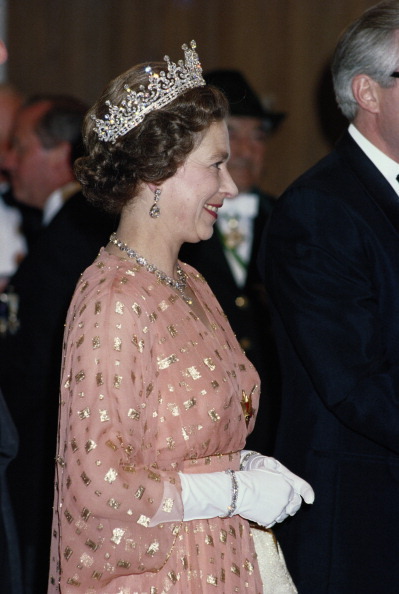 I'll see you Tomorrow with a new post highlighting post-1989 events!